Mercer County Park, approximately 2500 acres, primarily in West Windsor, offers many sports facilities, including Lake Mercer (used by locals as well as the U.S. Olympic Rowing Team), playgrounds, playing fields, skating center, tennis center, as well as nature/bike trails, paved (accessible by wheelchair) and off-road. Mercer County Park trail map. 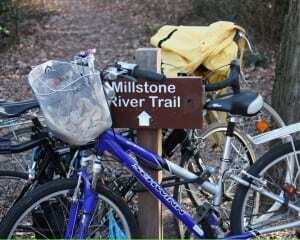 The Millstone Trail is off Millstone Road, just south of the border with Plainsboro. Parking is available. The trail connects to Melville Road. Millstone West is across Millstone Road and accessed via Joanne Street. The trail has two loops. Note: No parking is permitted on Joanne Street. Please use the parking lot provided off Millstone Road and walk across the road to Joanne Street. The Rogers Preserve connects the Sherbrooke development to Clarksville Road. A spur connects to Cranbury Road near the bridge over Bear Brook. Ron Rogers Arboretum, across from West Windsor-Plainsboro High School South, at the corner of the Princeton-Hightstown Road (Route 571) and Clarksville Road, has a paved path identifying the many oak (Quercus) species planted throughout. The 25-acre park has 13 acres of mature woodland with paths and 12 acres of open field, including a memorial to the victims of September 11 attacks. The Trolley Line Trail is a 2.5-mile multi-use trail that runs begins near the northern end of Rabbit Hill Road, passes through Community Park, crosses Route 571 and follows it along the Windsor Business Park before turning south. It ends at Penn-Lyle Road. The route essentially follows the PSE&G power lines. The Zaitz Woods Preserve, a 150-acre parcel off Southfield Road, has a number of trails. See the map at the kiosk. For information about helping to maintain West Windsor trails, click here.